It is one of the more ancient singing style and dance. They are related with the Arabic-Andalusian gypsy dances, such as the zambras and the jarchas. It is said that the fandango was spread for centuries throughout Spain acquiring the character of each region. The moorish Fandango became jotas, alboradas, muñeiras, boleros, malhaos, and many others. 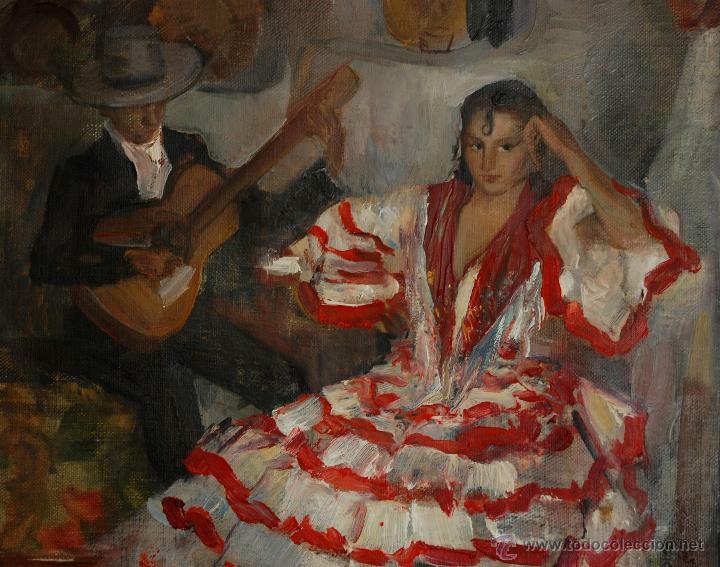 The verdiales are one of the most primitive forms of the Andalusian fandango. It is a singing which comes from the Andalusian Muslims. The name comes from the region of Malaga where they were born. The verdiales are groups of musicians, singers and dancers. They play guitars, violins, tambourines, street music, castanets, canutos and almireces. Their costumes are very cheerful and spectacular. The style is marked by a great polychromy of ribbons. The female costumes remind to the peasants from Malaga in parties and the male costumes are simple: trousers, shirt, strap and waistcoat and a hat made of palm with lots of colours, small looking-glasses and ribbons. The joy of this beautiful music inspired a lot of choreographs during the golden time of the Spanish dancing such as Pilar López, José Toledano, Emma Maleras and Antonio. We only have to mention the granainas and medias granainas before finishing. Even if they are descendants of malagueñas if we see the family tree we will check that they are the most distant from the Malaga trunk. We check in the book Mundo y Formas del Cante Flamenco in which the authors Molina and Mairena do a differentiation of the singings. There are two types: the granaina and media granaina. The granaina is easiest and more beautiful; if it is performed by a good singer it can almost reach the malagueña nature. The media granaína, however, is a song filigreed and affected which produces more admiration than emotion. These singings were orphan when they were born; they were ignored by the world of dancing. It was in the year 2000 when the flamenco dancer Merche Esmeralda danced them for the first time in the flamenco play Tormenta de Arena, with the same tear than the singer Charo Manzano. The Singer and guitarist Juan Breva from Malaga is also the inventor of the dance abandolao. He gave a slow and flamenco character to the verdiales, turning them into bandolas, generating in the family tree another branch of Malaga. There are different local varieties of the bandola: the rondeñas, the jaberas, the zángano, etc. Like the malagueña, the rondeña went also through the workshop of the Bolera School and had a strong impact in the XIX century.